In lieu of Services we are looking to have an In-Home Shabbat experience. 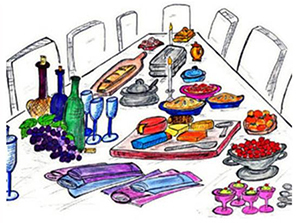 We are looking for volunteers to host Shabbat Dinner. No fancy or elaborate dinners are necessary! Shabbat is made by getting together with friends. This is only possible if you participate. Contact Rabbi Metz if you have any questions. Please fill out the form below, to let us know how you would like to participate.